Some explanation first. Sudden Doom gives a chance for each auto attack to proc a free Death Coil (but still counts for Dark Arbiter dmg increase). And Unholy Frenzy is a talent that increases your attack speed by 100% for 2 sec everytime you burst a wound. Which means that you're supposed to get twice as much proc of sudden doom in a fight where you have 100% uptime of unholy frenzy and at range of auto attacks. 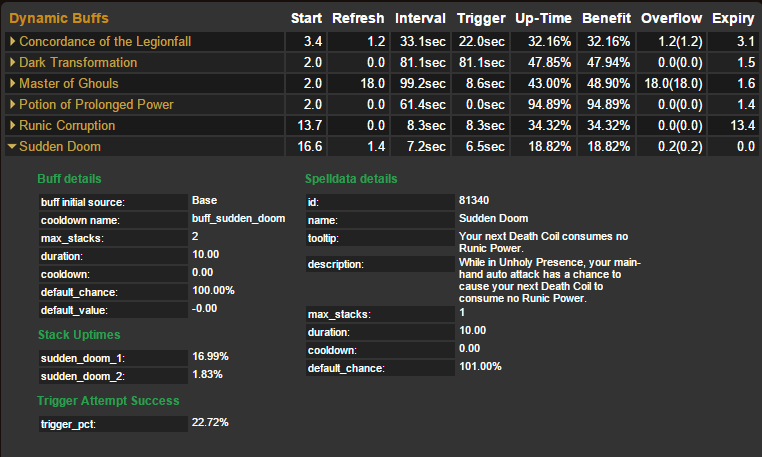 But this is not working, unholy frenzy doesn't make you proc more sudden doom, or atleast not enough. As you can see, I had 8 procs of Sudden Doom. 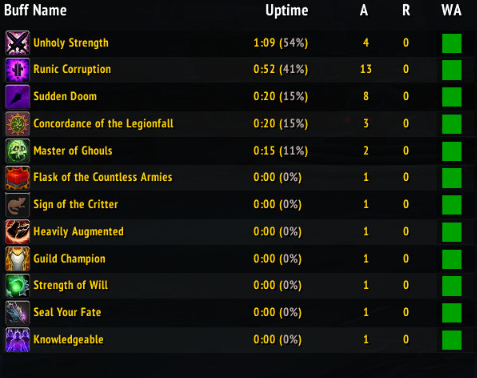 As you can see, I had 97% uptime for unholy frenzy buff, which means I had 100% increased attack speed for the whole 2 minutes fighting. But, I only got 10 proc of Sudden Doom. Which is not enough at all. There was an interval between procs of sudden doom of 7.2 seconds. To calculate the number of proc : 120 seconds / 7.2 = 16.6 proc. So 60% more than what I got in game. Because it is attack speed and not haste. 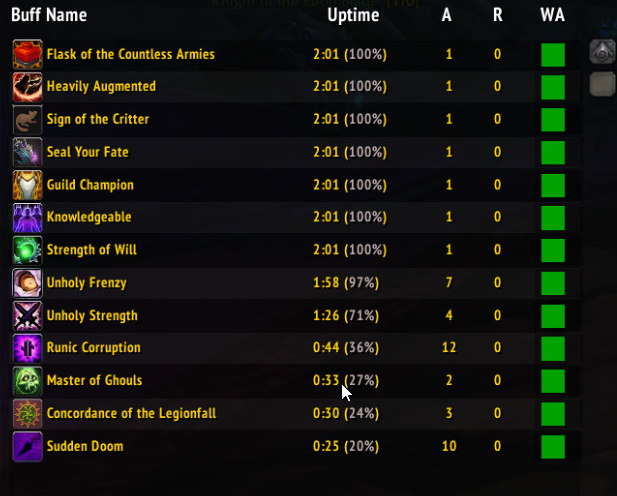 Only thing that affects rppm is haste rating, and haste% buffs like heroism. With the RPPM system, it doesn’t matter how many spells you use or swings you take (like it does on chance-to-proc on hit trinkets), which is why attack speed increases are irrelevant. Its the same story for casters too, they have casting speed which is the same as attack speed, and haste. Unholy frenzy talent is supposed to make sudden doom proc more frequently, even though the talent increases attack speed, not haste. I'm trying to understand, am I missing something ? Actually, nevermind! You are correct, due to a hotfix in 2016 unholy frenzy started increasing sudden doom's chance to proc even though it is attack speed not haste but in 7.2.5 sudden doom received a change where it procs 20% slower which MUST be also implemented here if this gets fixed otherwise things will get out of control. Legion Patch 7.2.5 (2017-06-13): Sudden Doom now procs 20% slower. Hotfix (2016-08-08): "Sudden Doom's chance to activate is now increased by melee attack speed (was Haste)." Wish you would have provided this proof in your original post, would have saved me some partially useless posting. EDIT : I saw your reply too late. @naboun read my previous reply. Indeed, Sudden Doom should scale with Attack Speed (not only Unholy Frenzy). Right! just checked myself, fingers crossed this is the actual problem for DA damage and we can move on with our lives! Me too ! I hope DA damage will be viable soon.